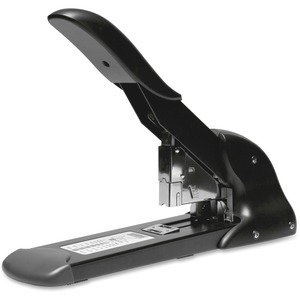 This robust heavy-duty stapler is made using recycled plastic and staples up to 220 sheets. The leverage mechanism is optimized for high-capacity stapling, requiring less effort to use while providing a jam-free operation. Stapler is front-loading with a rear push-to-open button. Rubber base provides stability, and an adjustable throat allows deep stapling.